Spontaneity is the quality of being able to do something just because you feel like it at any given moment, of trusting your instincts, of taking yourself –and others—by surprise and snatching from the clutches of your well-organized routine, a bit of unscheduled pleasure. That’s what Random Acts of Culture (RACs) is all about. The Knight Foundation is bringing short, spontaneous bursts of classical music, theater, dance and opera to the streets in eight communities: Akron, Ohio; Charlotte, N.C.; Detroit, Mich.; Macon, Ga.; Miami, Fla.; Philadelphia, Pa.; San Jose, Calif. and St. Paul, Minn. Thanks to this new initiative, you might just experience a bit of culture where you less expected it—think Mozart at the mall and La Traviata in the market. More than 1,000 RACs have been planned for the next three years. The Knight Foundation’s arts program invests in projects that enrich and engage communities. “Not everyone can make it to see the opera, or the ballet. 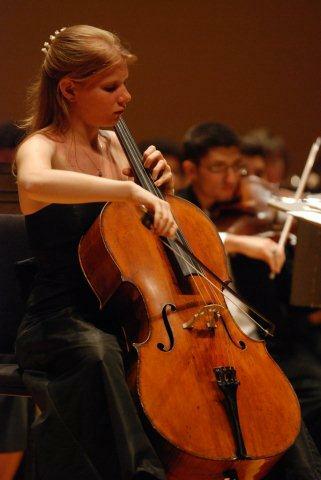 But when you get a taste of it – even for just a few minutes – you feel the magic that the classical arts bring to our lives,” said Dennis Scholl, Knight Foundation’s vice president/arts. Many supporting the program believe that arts are the highest form of human expression. They describe beauty, speak to our soul, engage and enrage. They celebrate our community’s diversity and etch our shared experience. The arts inspire. These Random Acts of Culture are already happening in public places like airports, malls, and business meetings. They have already generated more than 500,000 views on KnightArts.org and three million YouTube hits. In November, Random Acts of Culture hit Aventura Mall as the Frost School of Music from University of Miami performed six spontaneous jazz moments on a busy Saturday afternoon. Pleasantly surprised audiences talked about how these acts were very touching and appealing—and a welcome respite from everyday routine. “I felt all these random people in the mall come together as one to share this wonderful experience,” said one beaming shopper. Also in November, mingling in plain clothes throughout the crowds, more than 650 Philadelphia singers burst into a performance of Handel’s “Hallelujah” Chorus from Messiah at a downtown Macy’s. Mouths dropped. Shoppers pointed, laughed and smiled – joining a growing group of people witnessing “Random Acts of Culture” in eight cities across the United States. By providing much-needed resources for these Random Acts of Culture, Knight Foundation extends the reach of the classical arts beyond our theaters and allows new audiences to experience the joy of performances in a most visceral and unforgettable way. What has 7,000 people, 150 local arts and community service organizations, 8 bands, and 20 epicurean selections — on wheels? The FALL FOR THE ARTS FESTIVAL! An astounding 7,000 Miamians – from toddlers to seniors – took over the Adrienne Arsht Center campus for an afternoon of free performances on Sunday, September 12. They interacted with exhibits from more than 150 local arts and service organizations, children’s activities, gourmet food truck treats, and unlimited opportunities to engage and volunteer with local non-profits. 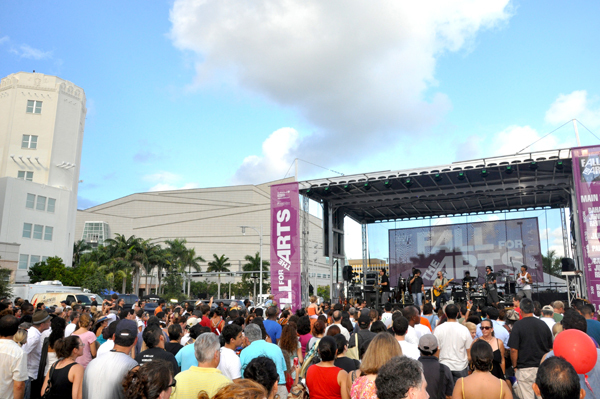 FALL FOR THE ARTS FESTIVAL was an unprecedented collaborative effort to showcase the coming arts season, and celebrate the vibrant and diverse culture and community of Miami. During the course of the day, the Adrienne Arsht Center and participating organizations gave out more than 40,000 flyers and brochures and more than 150 arts and community service organizations connected with thousands of potential patrons. CBS 4 anchors Lissette Gonzalez, Marybel Rodriguez, and Jawan Strader served as special guest MCs, and kept the vibe cool even on the sultry Miami afternoon. The free main stage performances by Grammy Award-winning urban Latino fusion band Ozomatli and New Orleans kings of funk Rebirth Brass Band had audiences on their feet dancing and cheering. Families filled the Adrienne Arsht Center’s Parker and Vann Thomson Plaza for performances on the family stage, face-painting, and craft-making throughout the festival. On the family stage, Peru Expresion, Fushu Daiko, and the thrilling break-dance crew Flip Side Kings delighted and inspired audiences of all ages. Inside the Carnival Studio Theater in the Sanford and Dolores Ziff Ballet Opera House, the Center offered free acting and break-dancing workshops. 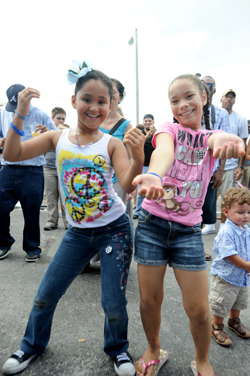 Nearly 1,000 Miami kids attended, and learned to “pop and lock” with mom and dad watching – and sometimes even joining in the fun! The Adrienne Arsht Center also offered free workshops and seminars throughout the day, with nearly 200 Miami community members in attendance. The Center also called on their volunteer to ensure smooth operations throughout the festival, contributing more than 600 combined hours of service in just one day! 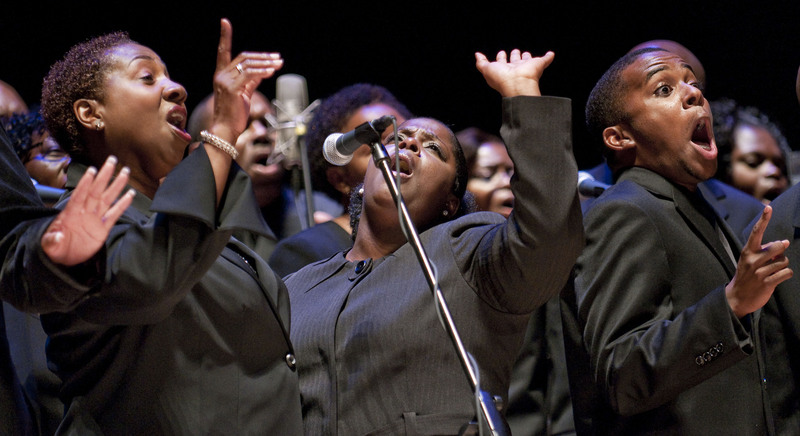 In preparation for the fourth season of Free Gospel Sundays, the Adrienne Arsht Center for the Performing Arts of Miami-Dade County recently held auditions for The Miami Mass Choir, which will become the resident choir for the 2010-2011 Free Gospel Sundays. The open auditions were held on August 7, 2010, in the Peacock Foundation Studio. The Miami Mass Choir, under the direction of Pastor Mark Cooper, is 50 voices strong and brings together the best gospel voices of South Florida, from Lauderhill to Florida City. Pastor Cooper is no stranger to the gospel choir medium, as he has been an active director, producer, songwriter and gospel musician for more than 20 years. Cooper originally founded The Miami Mass Choir in 1995 and led the Stellar Award-winning ensemble until the group dissolved in 2004. As Cooper reassembles his choir this year, he hopes to bring together the greatest talent South Florida has to offer. The newly formed choir will make its debut at the Free Gospel Sundays first performance on October 17, 2010 at 4:00 pm in the Knight Concert Hall along special guest star Shirley Caesar and the 93rd Street Community Baptist Church choir. Hot off the heels of being nominated for several Carbonell awards, the cast of BroadSword came out this past Saturday to kickoff the 13th Annual BeerFest event and announce the BroadSword Official US Air Guitar South Florida Competition. The Adrienne Arsht Center street team greeted fans from its very own BeerFest’s BroadSword Booth. Thousands of South Floridians attended the event to hear great live bands and sample more than 120 beers from around the world. In a special promotion to support BroadSword, the heavy metal play soon to open in its Carnival Studio Theater, the Adrienne Arsht Center and the Miami New Times have partnered with area clubs to hold air guitar competitions through May 1st. Will the Center find that special person who embodies the spirit of BroadSword and has the skills to represent the United States in the World Air Guitar Competition in Oulu, Finland, this summer? In the upcoming weeks, look out for mini pre-qualifying competitions in some of the area’s hottest rock clubs leading up to the BroadSword Official US Air Guitar South Florida Competition on May 1st. The winner of that event will be flown to the next U.S. Regional Competition in Las Vegas on May 28th to compete against others from around the country for their shot at the title, cash and prizes. The Adrienne Arsht Center Street Team was out in full force on Saturday at the Miami Beach Gay Pride and Expo along South Beach’s Ocean Drive. For the second year in a row, the enthusiastic street team of great volunteers and dedicated staff donated their time to help support the lesbian, gay, bisexual and transgender community. More than 30,000 people attended the Pride festivities this year – almost 10,000 more than last year. The street team greeted fans and got the word out on the upcoming show Spring Awakening and the 2010/2011 Broadway in Miami Season. On March 24 the Ziff Ballet Opera House was lit up by bright, young artists from New World School of the Arts in their annual “Rising Stars” student concert. The quality of programming and performances was a true testament to the high level of training and leadership at New World School. Created by the Florida Legislature as a center of excellence for the arts and opening in 1987, New World School of the Arts (NWSA) is a school and college conservatory with programs in visual arts, dance, theater, musical theatre, instrumental music, and vocal music. In addition to its close proximity to the Adrienne Arsht Center, NWSA’s commitment to the highest quality performing arts aligns both organizations resulting in a fruitful partnership that started when the Center opened in 2006. Beginning with NWSA’s participation in KidsFest in the Center’s Inaugural Season, young people from the school have been on the stages and in the rehearsal halls from the day the Center’s doors opened. Past performance highlights include orchestral and vocal accompaniment for last November’s Lincoln Bicentennial event where studetns performed a segment of Aaron Copland’s Lincoln Portrait, with narration by Alonzo Mourning. In addition to performances, students from NWSA have participated in numerous master classes with world class artists who perform at the Adrienne Arsht Center and have attended the Jazz Roots educational programs and concerts. Students are also active in the summer programming at the Center in the role of Group Leaders for AileyCamp Miami, a summer camp for middle school students. The opportunities for learning through their participation in Adrienne Arsht Center events enhances both the artistic and academic growth of these up-and-coming artists.